Virginia Madsen, Tony Todd, Xander Berkeley, Kasi Lemmons, Vanessa Williams, DeJuan Guy, Marianna Eliott, Theodore Raimi, Ria Pavia, Mark Daniels, Lisa Ann Poggi, Adam Philipson, Eric Edwards, Carolyn Lowery, Barbara Alston, Sarina Grant, Latesha Martin, Lanesha Martin, Michael Culkin, Bernard Rose, Glenda Starr Kelly, Kenneth A. Brown, Caesar Brown, Terrence Riggins, Gilbert Lewis, Rusty Schwimmer, Baxter Harris, John Rensenhouse, Mika Quintard, Doug MacHugh, Carol Harris, Stanley DeSantis, Diane Peterson, Michael Wilheim. 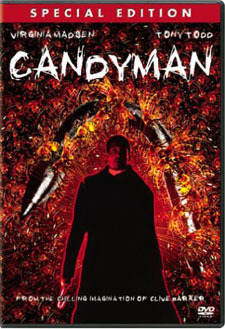 Candyman started out as The Forbidden, a short story written by the acclaimed horror/fantasy author Clive Barker. It is the story of a graduate student’s investigation into a grisly urban legend with distinct racial and social undertones. Director Bernard Rose’s (Paperhouse, Immortal Beloved) adaptation has given the narrative an underlying intelligence and believability. Unlike most horror films Candyman is low on special-effects but still delivers hair raising suspense and surprising shocks, primarily with its creative imagery. Bernard Rose’s innovative and realistic direction, the excellent cast (Virginia Madsen as Helen the graduate student and Tony Todd as Candyman) and the Cabrini Green location (a notorious Chicago housing project) make this film an original in its genre. Written for piano, pipe organ and chorus, Philip Glass’s score is perfectly suited for this modern gothic tale. Using some of his well established techniques of rhythmic intensity and switching between major and minor key harmonies, Glass’s score is as trance inducing and terrifyingly seductive as Candyman himself. Tristar Pictures presents in Association with Polygram Filmed Entertainment a Propaganda Films Production. Producer: Alan Poul, Sigurjon Sighvatsson, Steve Golin. Screenwriter: Bernard Rose from the short story The Forbidden by Clive Barker. Photography: Anthony B. Richmond B.S.C. Production Designer: Jane Ann Stewart.